General. 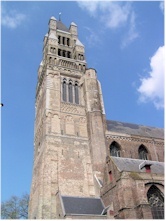 Saint-Saviour's cathedral (Sint-Salvatorskathedraal) is the main religious building of the town. 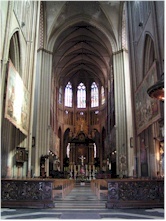 It became a cathedral only in 1834 when the diocese of Bruges was reinstated after the French occupation. The tower still bears the traces of the earlier romanesque church, giving it a massive outlook. When the Saint-Donatians cathedral was demolished and sold, quite a few pieces found their way to this church. They were used for the interior or added to the treasury. Among the most eye-catching artefacts in the interior are the organ, the sculpture of "God the Father", priceless paintings, impressive 18th century wall carpets and choir stalls that date back to the 15th century. The cathedral also has a museum. 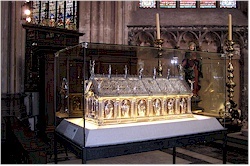 It holds a collection of priceless pieces from the cathedral's treasury but also from the former Saint-Donatians cathedral and other religious sites. Brief history. The history of the church is marked by several fires that each time required large-scale reconstructions. The first church on this place was probably erected somewhere in the 9th century and became an independent parish by the end of the 11th century. After a fire, the construction of a new church in romanesque style started in 1127. Traces of that building can still be found in the base of the tower. This building's existence was short because by the end of the 13th century it had to be reconstructed, this time in gothic style. In its core, it is the building as it exists now. In 1358, again a part of the church is destroyed by yet another fire. Repairs followed and the occasion was used to expand the place. During the 15th and 16th century several additions were made. In 1834, the diocese of Bruges was reinstated after it was abolished during the French occupation. Since the Saint-Donatians cathedral was demolished in 1799, Bruges had to look for a new cathedral. 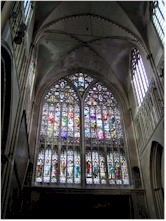 The choice fell on the Saint-Saviour's church. Another fire in 1839 damaged the roofs and the tower. As a consequence, the tower was redesigned and received its current look.